The Republic of Korean pianist Sun-Ah Kim and former student of Chiang Mai Music Festival Co-Founder, Professor Tong-Il Han, delighted a packed salon at the home of Anne and Kazuyoshi Murase, the two other co-founders of the Chiang Mai Music Festival on Friday February 26th. What a radiant and sparkling performance she gave. Opening with the often sad and nostalgic Rondo in A minor K 511 by Mozart written in March 1787, the audience was treated to a profoundly deep understanding of this wonderful piece of music. Sun-Ah brought out the despair and despondency that Mozart admitted feeling at that time in his life, but she also managed to inject several rays of sunshine and hope into the lighter passages between the Rondo’s gloomier A minor opening theme. Better was yet to come. Sun-Ah enthralled the crowd with wonderfully sensitive interpretations of Liszt’s transcriptions of songs by Schumann (Widmung) and Schubert (Fruhlingsglaube). Here Sun-Ah extracted a glowing sensation from the melodies of these pieces, while demonstrating her agility and total command of the keyboard in the accompanying arpeggios and dotted rhythms on the left hand. 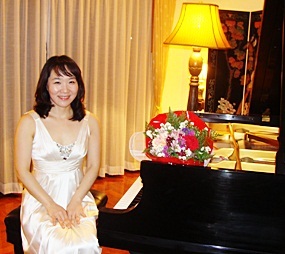 Korean pianist Sun-Ah Kim offered an ardent and impeccable performance of Mozart, Schubert-Liszt, Schumann-Liszt, and Beethoven before returning to Seoul for another year as university teacher and performing artist. The short recital ended with a stunning performance of the Beethoven Opus 110 piano Sonata in A flat. Written as part of a trio of sonatas in the early 1820’s, these three are the final piano sonatas Beethoven wrote some 5 years before his death. In the middle of writing the Opus 110 Beethoven was taken ill with a severe attack of jaundice, the illness which was later to claim his life along with other liver-based complications. Sun-Ah managed the tricky task of balancing the despair and gloom in parts with the radiance and joy in others, no more so than in her interpretation of the final movement which was characterized by playing that was determined, powerful and deliriously optimistic. Once again her command of the keyboard was startling, especially as she was suffering from hand strain, completely unnoticeable to the audience. The intimate atmosphere in the music salon of the Murase home was a perfect setting for an artiste such as Sun-Ah who rose to the occasion by giving the audience a performance full of deep musical expression but without the heaviness that could so easily have overwhelmed the people there. This deeper understanding of salon performance and composers intentions by Sun-Ah combined to provide a first class and memorable evening. This recital was one of half a dozen promoted by the Friends of the Chiang Mai Music Festival, with more exciting events to follow in March, June, July and in the autumn. Although there are many retirees in Chiang Mai it has been lacking in quality senior care. For those retiring in Chiang Mai and concerned about their future, or for those who wish to bring their parents or elderly relatives here for care, Dok Kaew Gardens is certainly worth looking into. One of the things that has always been of concern for those living in Thailand is where to go when they begin to need help. Whether for a short time or permanently, the new residential facility is now available 6 km south of the city.. Located at McKean Hospital, its been open since November 2009. Dok Kaew Gardens is made up of three inter-connected buildings: Lotus Wing, Jasmine Wing and Dok Kaew Center with 25 rooms available in total. Each bedroom is fully furnished with air conditioning and a private handicap accessible bathroom with hot water. Emergency call lights located in all bedrooms and bathrooms can summon help 24 hours a day. Security cameras monitor common rooms and walkways. There are smoke alarms in every room to ensure fire safety. The Jasmine Wing offers specialized care for those needing increased assistance or the mobile senior with dementia. An important factor for those coping with mobile seniors with senile dementia, entry and exit doors are secured and staff numbers reflect the increased demands of those residents that require 24 hour attention. With meals, a beauty salon with masseuse and a library with a computer, there is quite a bit here to offer those in need of assisted living. Rooms also offer wifi connections. For those requiring physical or occupational therapy, McKean’s highly regarded rehabilitation room is a short wheelchair ride away. For more information or to arrange a visit, contact Beth Roadarmel (English) or Achaan Trairut (Thai) at 053-124-430 or 053-124-263 ext.139. E-mail [email protected] mckeanhosp.org . Further information can also be found at their website: www. mckeanhosp.org. On Saturday March 6th Santi Saengthong, head of the Santi School of Music, and nine of his students provided a select audience with a delightful selection of piano music including works by Mozart, Chopin and Schubert. The venue for the occasion was the increasingly popular and intimate music salon at the home of Anne and Kazuyoshi Murase at Ban Wangtan. This wonderful room with its tasteful d้cor, subdued lighting, exquisite furnishings and uniquely intimate atmosphere provided a perfect setting for these pieces by such well-known classic and romantic composers. The students had all spent hours in rehearsals and it was gratifying for them to be able to perform in front of their teachers and parents. A number of guests from the community and Friends of the Chiang Mai Music Festival brought the numbers up to a reasonable size. The young performers, aged from 10 to 17 performed extremely well, some of them finding the trickier passages hard to cope with, but with determination and perseverance, treating the audience to a display of musical talent in a most professional manner. Santi himself played the piano in three of the chosen pieces, the highlight being Schubert’s great classical-romantic Fantasy in F minor, composed a few months before his death in 1828 and written for four hands on one piano. On March 1st two hundred years ago, Frederic Chopin was born in Poland and the young upcoming musicians performed three of his pieces with style and panache. How astonished Chopin would have been if he could have seen and heard his marvelous music being played with such promise in the centre of northern Thailand, a country whose name, during his lifetime, he had probably never heard! Mozart, that inimitable genius of a composer was also represented with three pieces, including the wonderful set of twelve variations on the song “Ah, vous desirai-je maman’, better known in the English version as ‘Twinkle, twinkle little star’. The evening ended with a marvelous arrangement of the jazz favourite ‘Autumn Leaves’ by Joseph Kosma, a French composer who wrote a lot of film music in the middle of the last century, this song coming from the score of one such film and now a universal success. What a lovely evening this was – to witness young people displaying their piano skills in these beautiful surroundings to an appreciative audience. Chiang Mai has some great potential talent among its musical students. This newspaper recently reported that the Santi School of Music was a very good school, providing very good value for money with very good teaching and learning. That was certainly reinforced by the performance of the students who, along with their dedicated and hard-working teachers, deserved all the praise and the recognition that the audience had no hesitation in giving them. The National Elephant Hospital at the Thai Elephant Conservation Centre (TECC) in Lampang was established under Royal Patronage and continues to be a beacon of hope for ailing and elderly elephants in Thailand. A symbol of the nation and the Royal Family, Thailand’s elephants require help. The National Elephant Hospital provides free veterinary services not only to the elephants at the Thai Elephant Conservation Centre, but also to elephants from neighbouring provinces. Veterinarians also travel to treat sick or injured animals unable to be moved, even in remote areas. According to the TECC there were over 100,000 domesticated elephants working in Thailand at the beginning of the 20th century. Elephants were originally found throughout the countryespecially in the north of Thailand where there were abundant teak forests and the elephants were used to haul teak logs. As of 2007 there were 3,456 domesticated elephants in Thailand and the population seems to be stable. The British first used elephants for logging in the late 1800s and a young elephant training program was instituted in 1969 in Lampang to train elephants in logging. However, over logging and deforestation resulted in a ban of teak logging, throwing Thailand’s thousands of domesticated elephants out of work in 1989. Many elephants ended up on the streets with their owners, while others ended up in tourist shows. The Forest Industry Organization of Thailand established the TECC in 1992 and with it a hospital, Mobile Elephant Clinic (MEC), reintroduction of plantations of elephant food, the Last Home for Elephants and an elephant show for tourists. The National Elephant Hospital officially opened in 2002 and treats ailing elephants around the North. While they do have a small budget from the Ministry of Natural Resources and Environment, it survives on public donations, help from the RSPCA Thailand and other organizations. Their veterinarians log 70,000 km a year, travelling to treat elephants in the region. Most commonly seen ailments include abscesses caused by harnesses, wounds around the ears and feet caused by controlling equipment, tail wounds from bites by other elephants and most commonly, gastro-intestinal problems associated with improper feeding or contaminated food. Due to budget shortfalls this year, the National Elephant Hospital has had to appeal for help from the public. For those wishing to help this noble animal and the hospital that treats them you can contact Dr.Sittidej Mahasavangkul of the Elephant Hospital, Thai Elephant Conservation Center email [email protected] com or by phone: 081 884 5834 - he speaks English. If you wish to make a donation please do so at the Krung Thai　Bank, Pratu Chai Branch. Account number 536 1 555 959, the account name is Elephant Hospital, Thai Elephant Conservation Center. Help these doctors make a difference. This month is the 200th anniversary of the birth of one of the greatest composers of piano music who ever lived. Frederic Chopin was born on March 1st 1810 in Zelazowa Wola fifty kilometres west of Warsaw in Poland. He was described in his youth as a potential genius by teachers, and he eventually began to use his intimate knowledge and inspiration to compose music of the highest order, largely for the piano. In September 1831 when he was just over 20 years old he arrived in Paris unsure of whether to settle there or not. He undertook further lessons in the city and gave his first French concert in 1832 which was reviewed as “an extravagance of original ideas that are unexampled anywhere”. 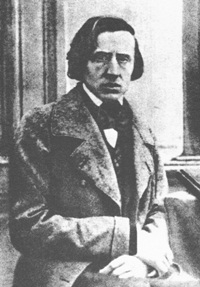 However, Chopin had a light-handed touch and he soon realized that his performances were unsuitable for large concert halls; instead he became the pianist of the salons, meeting and forming friendships with other composers such as Berlioz, Liszt, Bellini and Mendelssohn. He lived in quite substantial apartments where many of his compositions were first performed. As well as inventing pieces with titles such as Nocturne, Etude or Polonaise, he also instigated the notion of ‘salon music’, music played to groups of around twenty people in the more intimate surroundings of his apartment. These social gatherings were later to develop into very important outlets for other composers, especially names like Saint-Saens, Ravel, Debussy and Faure. He eventually settled in the Place Vendome four months before his premature death from tuberculosis at age 39. The Friends of the Chiang Mai Music Festival are proud to be part of the Chopin celebrations taking place all over the world this year and they have re-created that very intimate and unique atmosphere of the music salon in the home of Anne and Kazuyoshi Murase at Ban Wangtan. Here frequent recitals are held that are very similar to those initiated by Chopin in Paris in the early 1830s. On Friday March 19th the celebrated Japanese pianist Yoko Kakishita, who has already delighted audiences here in Chiang Mai on a previous occasion, will come to the salon to perform all the Chopin Preludes and one of his Fantasies. The preludes were published in 1839 and dedicated to the lesser known composer of piano studies Joseph Christoph Kessler, who had some ten years earlier dedicated a similar set of 24 preludes to Chopin and the more famous composer Hummel. The preludes were commissioned by the famous piano maker and publisher, Camille Pleyel (of Salle Pleyel fame); they were written between 1935 and 1839 partly at the Majorca town of Valldemossa where Chopin had fled with his girl-friend George Sand and her children to escape the damp Paris weather. Seats at 250 baht per person are strictly limited for this rare opportunity to hear Chopin’s music in this unique setting and can be reserved in advance only from Anne Murase on 087 181 1417 anytime this week or from Khun JP on 084 868 1017 on Thursday evening the 18th March or anytime on Friday morning March 19th. Chiang Mai residents are in for a special threat, on the occasion of H.M. the King’s 83rd birthday this year, Thai Airways Intl, the Chiang Mai Ballet Academy and the Charity Committee have organized the 8th Annual Charity Ballet; Sleeping Beauty 2010 to be at Kad Theatre one day only, March 28, for two shows, one at 1:30 PM and the final show at 7 PM. This event of the season is not to be missed, with gorgeous costumes and wonderful dancing, the play will not only re-enact Sleeping Beauty with principal dancers that have one awards on three continents, but Ballet Academy students performing as well. Not only classical Tschaikovsky will be performed but modern styles of dance as well, from flamenco, to hip hop and modern. Mom Luang Preeyapun Sridhavat, winner of the Asia Pacific Inspired Woman Award in Art Category 2002 from Singapore is the Artistic Director. Tickets are on sale at Rimping Supermarkets, Kad Suan Kaew and Chiang Mai Ballet Academy Tel 089-6352586, 089-7885307 and 053-260373. All proceeds of one of the biggest charity events of the season go to Friends in Need (Of “PA”) Volunteers Foundation, Thai Red Cross Society; a foundation under the initiative of HRH Princess Pacharakitiyapa, to be used for disaster relief and for improving the life of people in local communities. Thai Airways International is offering round trip tickets from Chiang Mai to Bangkok as door prizes .Audiences are encouraged to dress up in pink for the show since pink is regarded as the color to offer H.M. the King best wishes for good health.Best pink outfits will win special prizes at the end of the show. For more info, please contact. 081-8811114. “You have won the lottery”. By now, you have probably received at least one email telling you this good news, and hopefully you’ve realized that in order to win a lottery, you generally have to have purchased a ticket! This is just one example of what is known as Advance Fee Fraud. The crooks, who generally hail from Africa or organized crime gangs in Eastern Europe, are just waiting for your reply. They will then engage you in a friendly conversation, before requesting a nominal $25 “bank processing” fee or something similar. And that is how they make their money. You send $25 dollars and wave goodbye to it, and if thousands of people do this (which they do), the criminals can settle down and live a happy and carefree life – with your money. Another example of the is the “Urgent” email you receive telling you that someone has died and left $25 Million in a bank account, and asking you if the person concerned can use your bank account to spirit the money out of the country. Oh, and naturally, if you are kind enough to do so, you can keep $5 Million of it for yourself. A very tempting offer? If it was real, maybe yes. Until, that is, the person on the other end tells you they need a few hundred dollars in cash to bribe a bank official to turn a blind eye. Then there is that “Executive Account Manager” who wants a hand out. But a few hundred dollars when you are looking at $5 Million? It can be sorely tempting until you realize you are being conned. More recently, emails are going out to people asking them to be “Corporate Financial Officers” or the like on behalf of an overseas company. This one sounds even more promising: All they want to do is put money in YOUR bank account, and ask you to pay it in cash to someone else, keeping a percentage for yourself. And it can happen; days after you provide the banking details, a few thousand dollars will appear in your account. What they don’t tell you is that this money has just been stolen from someone else’s bank account (maybe because spyware sent their Internet Banking username and password to the crooks), and they are using you to quickly change it into fast, untraceable cash. No surprise that they want you to use Western Union to pay the cash out at some exotic location like Bulgaria or Nigeria! Scams such as these should be avoided like the plague. When you participate in such schemes, you are actually money laundering, and this will earn you a not-so-cheerful visit from law enforcement officers. The general principle when reading emails is to use common sense, and remember the old saying: “If it looks too good to be true, it probably is”. One final version of the email scam, which seems to be increasing recently, is the “fantastic job offer”. Again, the idea is to offer you a highly paid, senior position in an overseas company. The catch? The $25 “employment facilitation fee” that you have to pay to process your application. And let’s not forget with any of the above, you are actually providing valuable personal information to professional (and often well organized) thieves and criminal gangs. They can use this information to change your bank details, obtain cheque books and ATM cards in your name and run up thousands of Dinars (or it could be dollars, pounds or baht for that matter) in debt using your name. Identity Theft is a common and rarely prosecuted crime nowadays, and it is important that you keep this personal information protected.